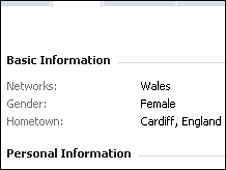 While you may be sure Cardiff is the capital of Wales, Facebook users in the city were baffled after the social networking website put it in England. People in Swansea, Wrexham and even the very Welsh sounding Llandrindod Wells were confused too as the location on their profile was also moved there. Over 8,000 users joined campaign groups demanding the locations on their profiles be returned to Wales. Facebook apologised, saying a bug had caused the problem. Some users e-mailed the US-based site since Friday to alert it to the error. Student Alex Smith said his friends had changed their location on their profiles to different Cardiffs elsewhere in the world as a protest. Mr Smith, 18, said he had been a user of the site almost since it launched in 2004 and the problem had never happened before. "I just noticed, and a couple of my friends did as well, it moved Cardiff to England for some unknown reason," he said. "It must have happened some time overnight. "A couple of my friends have sent suggestions - the only way Facebook users can contact them is to send suggestions - there are no replies as yet. "It's such an oversight - many people have changed their location to different Cardiffs - Cardiff New Zealand or Cardiff Australia - in defiance." And it is not just the Welsh capital that has been given to England on the site. Just look "what's occurring" in Barry in the Vale of Glamorgan. The seaside town in south Wales - made famous in the BBC series Gavin and Stacey - has been moved across the Severn Bridge and is now listed as Barry, England. And Welsh singer Tom Jones will have to search for the 'Green, green grass of home', as his famous song goes - his hometown of Pontypridd, in the south Wales valleys, is also now English, according to Facebook. But most confusingly of all is the fact that some places located within just a few miles of each other have different designations on the site - Pwllheli is listed as being firmly in UK, while nearby Abersoch and Nefyn are in England. Similarly, Caerphilly is in the UK - but Bedwas is in England; Tredegar in Blaenau Gwent stays in Wales and nearby Ebbw Vale - England. Over 8,000 people have now joined two Facebook groups to call for the return of Welsh places to Wales. One woman who joined the campaign commented on the website: "I tried to change it to Wales and it put me in Australia, New South Wales!!!!! How can there be a New South Wales without an old one to begin with??!!" Another user wrote: "Too many people already think that Wales is a part of England when its not, without this." A spokesperson for Facebook said: "There was a bug causing this issue which has been fixed. We apologise to users who were affected."